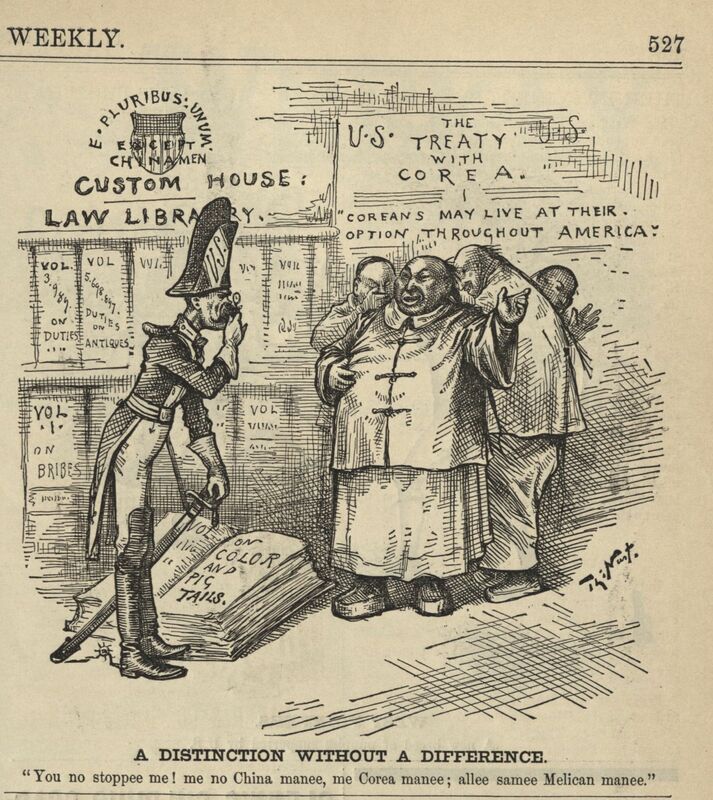 A few months after the passage of the Chinese Exclusion Act (May 1882), this small square cartoon shows a U.S. Customs House official scrutinizing his law books in an attempt to define or clarify the ethnicity of four Asian men appealing for entry into the United States. Three would-be immigrants are huddled behind a spokesperson, who denies he Chinese, and testifies he is instead Korean (Corean). Above their huddle, a banner testifies to the United States “treaty with Corea.” The sign also says, “Coreans may live at their option throughout America,” a privilege the Chinese once enjoyed under the protection and promise of the Burlingame Treaty. The official, wearing a bicorn hat (Denis Kearney? )*consults with an open volume which describes the characteristics that distinguish a Chinese national from a Korean one. 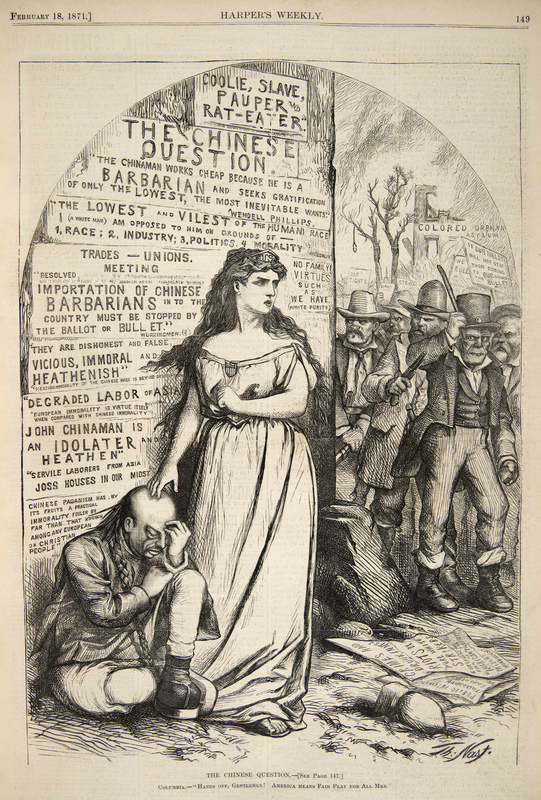 The volume refers to “color and pigtails.” The men attempting to enter the United States are wearing the Manchurian queues for which the Chinese were well known in America. The gaggle of Chinese men behind their spokesperson appears to find the claim amusing. This cartoon is familiar in theme and tone to “E. Pluribus Unum (Except the Chinese)” drawn four months earlier. *Denis Kearney was a self-described soldier against the Chinese immigrants. In California, San Francisco Wasp illustrator George Keller frequently depicted Kearney wearing military garb, and in particular, a bicorn hat. 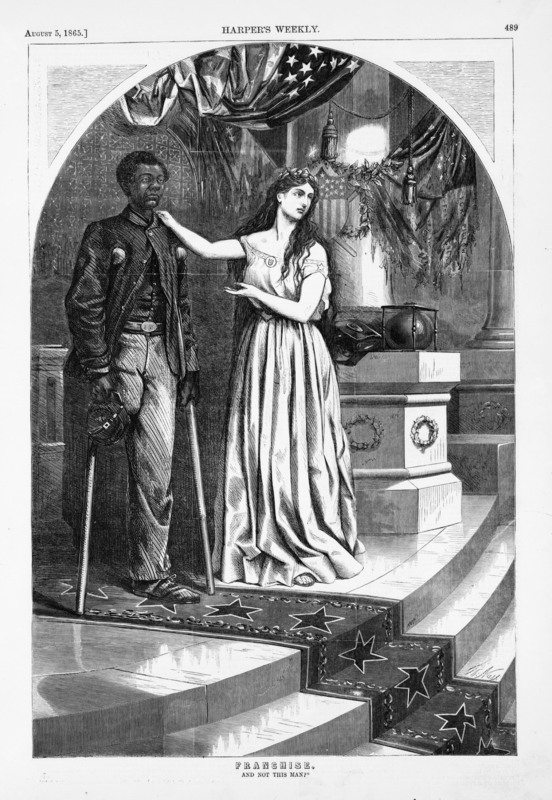 Nast also picked up the symbolism when referring to Kearney, though it cannot be determined this was his intent for this specific drawing.